There have been people claiming to have paranormal powers for thousands of years. However, scientifically we can say that as yet we still have no convincing proof that any paranormal abilities exist. We can show this using some mathematical tests – such as the binomial or normal distribution. You can test your ESP powers on this site (our probabilities will be a little different than their ones). You have the chance to try and predict what card the computer has chosen. 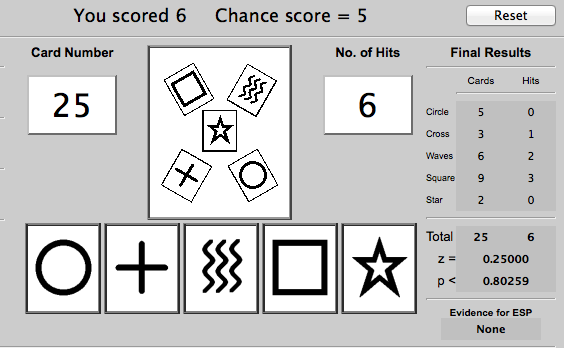 After repeating this trial 25 times you can find out if you possess psychic powers. As we are working with discrete data and have a fixed probability of guessing (0.2) then we can use a binomial distribution. Say I got 6 correct, do I have psychic powers? We have the Binomial model B(25, 0.2), 25 trials and 0.2 probability of success. So we want to find the probability that I could achieve 6 or more by luck. The probability of getting exactly 6 right is 0.16. Working out the probability of getting 6 or more correct would take a bit longer by hand (though could be simplified by doing 1 – P(x ≤ 5). Doing this, or using a calculator we find the probability is 0.38. Therefore we would expect someone to get 6 or more correct just by guessing 38% of the time. So, using this model, when would we have evidence for potential ESP ability? Well, a minimum bar for our percentages would probably be 5%. So how many do you need to get correct before there is less than a 5% of that happening by chance? Using our calculator we can do trial and error to see that the probability of getting 9 or more correct by guessing is only 4.7%. So, someone getting 9 correct might be showing some signs of ESP. If we asked for a higher % threshold (such as 1%) we would want to see someone get 11 correct. You can also test your psychic abilities with this video here. Hello, great article on the matter of are you psychic? For me, I do believe we are all psychic we are all born with these abilities and capable of using them. As we grow up we are learned by either parents or the people around us what is real and what isn’t. So we grow up and are brain tends to work different but we can tap into these abilities with practice and above all meditation and visualizations.